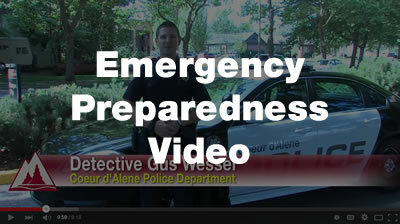 If you observe anything suspicious, sense a potential threat, or become the victim of a crime, dial 911 from a campus phone to access the Kootenai County 911 system, or use one of the outdoor emergency phones for direct contact to Campus Safety. Any emergency or possible criminal action can be reported directly by any student, staff or faculty member. Call quickly and do not assume someone else called. When using a cell phone to call 911, inform Campus Security separately, after placing the call. Emergencies, day or night, should be reported to the Campus Security Office whenever possible. Security personnel can respond and initiate whatever action is necessary, including the notification of specific emergency services (police, fire, ambulance). Security officers will follow up on reports and take action as appropriate, including writing an incident report to document the circumstances. Efforts are made to advise the campus community on a timely basis about campus crime and crime-related problems. When circumstances warrant, special printed alerts are prepared and distributed, either selectively or throughout campus. When criminal activity occurs which represents a threat to students and staff, the College will report this activity in one or more of the following methods: Campus or local media, alerts to classes in session, notification to department heads, telephone, email, messenger or bulletin board flyers. The kind of notification to be utilized and the time of notification will be dictated by the seriousness of the situation.